Rick Egan | The Salt Lake Tribune Brigham Young Cougars head coach Jeff Judkins reacts to a call by the official's, in Basketball action, Brigham Young Cougars vs. the Utah Utes, Saturday, December 10, 2016. Provo • Don’t blame BYU’s women’s basketball team if it turns down its next national ranking. The Cougars have now lost three straight games since their 11-game winning streak was rewarded with a No. 25 ranking just 10 days ago, falling 78-75 to Saint Mary’s in a Kids’ Day matinee at the Marriott Center on Thursday. Even 3,500 or so screaming elementary school children couldn’t BYU back on track, but not for lack of trying. Earplugs were needed at times as the huge scoreboards above the Marriott Center floor urged the youngsters to “Get Loud,” and they delivered. The noise was at a fever pitch toward the end of the third quarter when Paisley Johnson made a layup to give the Cougars a 60-53 lead. But Saint Mary’s (8-4, 15-8) scored the first eight points of the fourth quarter, and held on by executing better than BYU down the stretch. Johnson led the Cougars with 20 points, while Shaylee Gonzales added 13 before fouling out and Jasmine Moody chipped in 12. Megan McKay led SMC with 19 and Carly Turner added 16, including a clutch 3-pointer — SMC’s 10th trey — with a minute, 50 seconds remaining that broke a 70-70 tie. McKay followed with a basket to push the lead to five with just over a minute remaining after Brenna Chase’s shot rolled out. 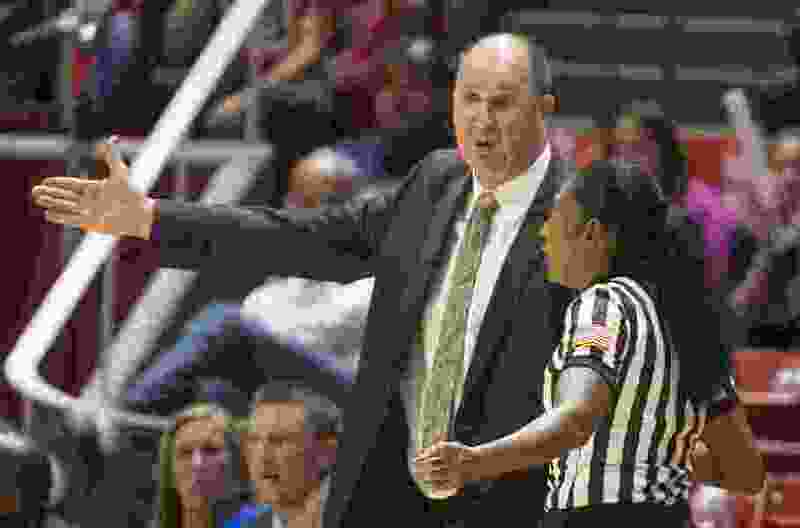 Defensive specialist Caitlyn Alldredge hit a big 3-pointer to get the Cougars within a bucket, but that’s when BYU’s key letdown of the game took place, according to Judkins. Turner missed a 3-pointer on the Gaels’ next possession, but after the ball was knocked around a couple times, Alldredge was whistled for a foul. The Gaels were able to take the clock down 30 more seconds before Jasmine Focadilla pretty much clinched it with two free throws. The Cougars had one last chance when Forcadilla missed a free throw with 10.2 seconds remaining. However, leading scorer Gonzales had fouled out and Judkins put 6-5 forward Malli Valgardson into the game in hopes SMC wouldn’t guard her and she could get off a 3-pointer. But Valgardson passed the ball to Maria Albiero, and her desperation 3-point attempt was blocked at the buzzer. “That wasn’t what I wanted,” Judkins said. Johnson, who was 6 of 15 from the field, said the Cougars will be back. The Cougars, who were without post player Shalae Salmon, were out-rebounded 48-31 and gave up 13 second-chance points. Judkins said Salmon has “an elbow problem” and is taking it easy for a week or two.